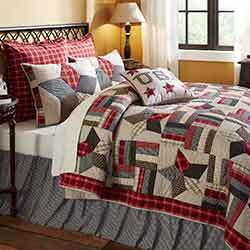 Take a slice of Americana and hide it away in your bedroom with the Glory Set. A splendid red is balanced by four neutral tones to bring unity and harmony to the room. 100% cotton. Part of the Mayflower Market Collection by VHC Brands.